Toured by Visions of Australia and Asialink. The human face is endlessly fascinating and it is not surprising that portraiture is one of the oldest and most popular genres in the visual arts. The story of Narcissus, who falls in love with his own image reflected in a pool, is the archetypal myth symbolising the human love affair with our own image. Like Narcissus looking at his own image in a pool of water, the portrait acts as a mirror held up to the human face. In today’s media saturated environment the archetypal mirror image is only one of many technologically mediated images of the human face that are now available to us. In addition to painted portraits and drawings, over the last 150 years new imaging and media technologies such as photography, video and digital media have initiated many new ways of representing the human face as a visual image. These different media forms mirror the human face in different ways and affect in very profound ways how we see and understand ourselves. They also play an important role in creating our sense of self and self-image. The Face to Face exhibition explores new media, contemporary identity and portraiture in the digital age. Artists have always been at the forefront in utilising and exploring the possibilities of new technologies. In the 21st century new media and digital technologies have given artists new and more powerful tools to transform and manipulate images of the human face. The plasticity of the digital image with its ability to be endlessly manipulated and transformed is particularly suited to the exploration of contemporary postmodern notions of identity as fl uid, fragmented and multiple. Digital media technologies can create images that are indistinguishable from conventional analogue photographs, fi lm and video, thus calling into question the reality status of the image. We can no longer be sure that ‘seeing is believing’. The digital image can combine the transformational interpretive qualities of drawing and painting with the visual ‘reality effect’ that we have become accustomed to with analogue photographs, film and video. New digital media and communication technologies have also opened up new arenas for audience engagement and interaction. Today portraits proliferate not just in galleries and photo albums but also on mobile phones, computers and the internet. Popular image sharing sites such as YouTube and Flickr and social networking sites like Facebook and MySpace are becoming the 21st century’s new public galleries where previously private images are now distributed globally. In the Face to Face exhibition we invite you to explore the new face of portraiture in a digital age. 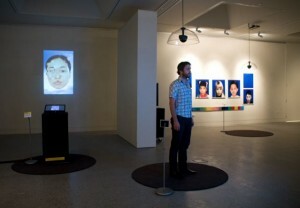 In this exhibition you will come face to face with a range of different digital portraits: poignant video portraits, computer animated talking heads, idealised images and avatars, digital faces that are fractured, morphed and transformed, and your own image captured and displayed before your eyes as a visual timeline of continually changing portraits. The artworks in the exhibition also hold up a mirror to contemporary culture and society showing us a portrait of ourselves in the 21st century. In these portraits we see our contemporary narcissistic obsession with celebrity, youth and beauty, the astounding fl uidity of digital image manipulation and transformation, our fascination with the power of science and digital technologies to analyse and transform the human image, and an emerging predilection for the creation of digital alter egos and fantasy identities. Michele Barker & Anna Munster, Denis Beaubois, Daniel Crooks, Anna Davis & Jason Gee, Emil Goh, Angelica Mesiti, Adam Nash & Mami Yamanaka, David Rosetzky, Rachel Scott, Stelarc, John Tonkin.